Disabled people pay "a financial penalty" on everyday living costs, spending an average of £550 a month extra, according to a report by Scope. The report pulls together existing research including new analysis of a 2010 survey by think-tank Demos. That research was funded by Scope. The new Priced Out report also features data from the Department for Work and Pensions and organisations including the London School of Economics, Save the Children, and the National Housing Federation. 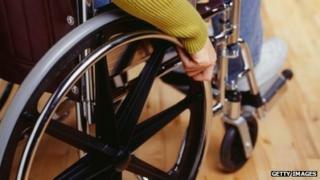 Scope said 17% of disabled people paid £800 a month more on everyday living costs than able-bodied people. And 10% paid more than £1,000 extra a month, it said. Other examples of extra everyday living costs included keeping the home warmer to help certain conditions, using more energy to run more regular baths and replacing clothes worn out because of wheelchair use. Scope chief executive Richard Hawkes said: "Disabled people and their families already have to buy things, like specialist equipment, that most families don't have to budget for. "Sometimes their condition means they have no choice to use more of something, like heating. "But this situation is being made worse because disabled people and their families also pay more for the everyday." The charity had heard "shocking stories" including disabled people being charged double the price for a taxi and £31 for a modified knife, fork and spoon set, he added. Scope said many people were struggling to pay the bills and were three times more likely to take out doorstep loans. The charity is calling on the government to protect the Personal Independence Payment (PIP) from an overall cap on benefits. Do disability rights cost too much?